A lot of people tell me that they can’t cook and I don’t think that’s true–the problem is that a lot of people never give themselves the opportunity to cook without recipes or guidance. That’s how you develop your instincts when it comes to cooking–by playing with different ingredients and flavors. As you gain experience doing that, you gain confidence. Your instincts get better. Cooking is not a skill you’re born with; it’s something that can only come with practice. If you’ve only cooked by following recipes, try putting together one meal a week without a recipe. It doesn’t have to be anything elaborate–in fact, it’s probably best to keep it simple. It might be disastrous at first, but I promise you, you’ll get better and better with each meal. Gnocchi is an easy ingredient to experiment with. And while I have a recipe for gnocchi on my blog, I don’t have a recipe using gnocchi. It was clearly time, right? Because gnocchi are little pillows of deliciousness. Since I’m on a Brussels sprouts kick, I added those too, along with fresh lemon zest, Parmesan cheese, toasted pine nuts, and olive oil. I knew all of these things went together because I’ve used them in my cooking before. Even though this was the first time I put all the ingredients together in a recipe, my experience told me it would work out. Which it did! You can serve this with a salad for a light meal or divide it into two or three servings if your appetite is a little bigger. It’s a delicious, easy fall dinner. 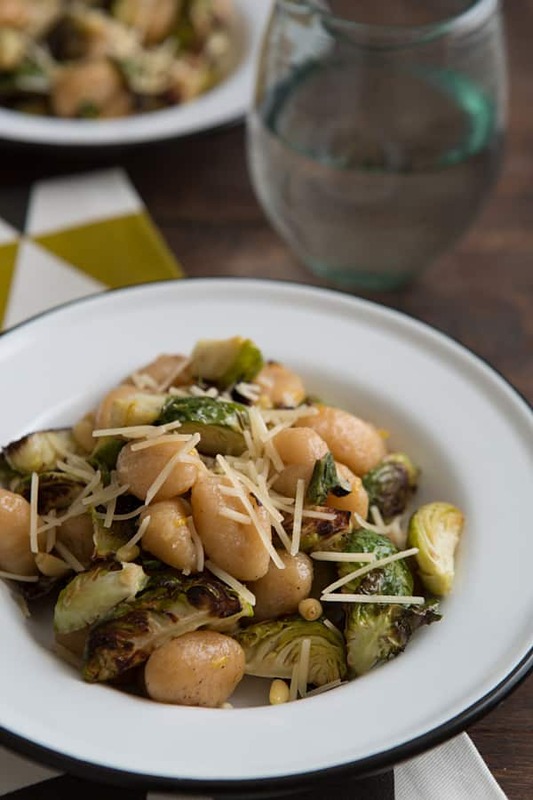 Gnocchi tossed with roasted Brussels sprouts, lemon zest, and toasted pine nuts. Toss the Brussels sprouts with 1 tablespoon of olive oil in a large bowl. Transfer to a rimmed baking sheet and roast in the oven for about 20 minutes, or until tender and beginning to brown, stirring occasionally. Transfer the gnocchi and Brussels sprouts to the large bowl. Toss with the lemon zest, pine nuts, and cheese, then season with salt and pepper to taste. In Europe, Parmesan cheese is never vegetarian. Substitute a different kind of cheese if you’re a strict vegetarian. I’m totally craving gnocchi after reading this post – it’s so light and bright and full of flavour. I love gnocchi! this is such a healthy and delightful recipe. Love gnocci! 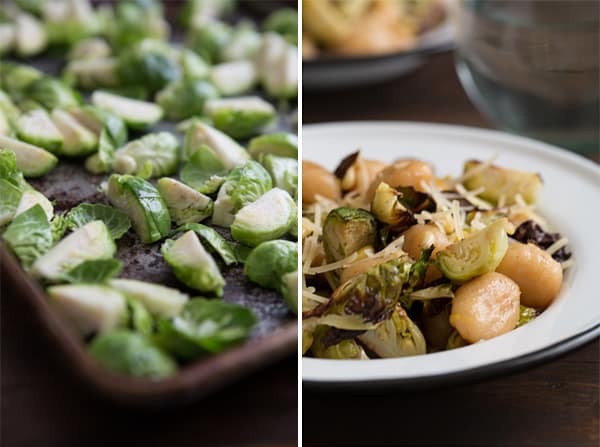 This version looks delicious with roasted brussels sprouts- the perfect fall dinner! Hard to go wrong with these delicious ingredients! Gnocchi are one of my favorite foods, and I definitely don’t eat them often enough. The combo with brussels sprouts + pine nuts sounds delicious! Brussels sprouts and pine nuts is such a good combination, but I’ve never tried it with gnocchi. Sounds perfect together! Looks great! I love gnocchi so much. 🙂 And I agree — while cooking is a learned skill, it is also an art form. Trying new recipes and ingredients can help to hone the “culinary instincts”, but flying in the kitchen without a safety net — ah, now that is freedom. Yes, that’s definitely how you learn! Wow! Brussel sprouts are one of my favorite veggies to roast, and I normally just roast them on their own and serve them as a side because I’m never really sure what else to do with them. This sounds delicious and so easy, I will have to try it. Thanks for sharing! How simple and perfect for a weeknight meal! Gnocchi is one of those things that I love but never buy for some reason…weird. Let’s change that! Love gnocchi! And you’re right – as long as you like the flavor of all the ingredients, they probably work well together!! Perfect timing – I just posted two gnocchi recipes on my blog this morning and haven’t had my fill yet. One thing I haven’t had success with is making gnocchi from scratch, so I’m off to read your recipe for homemade gnocchi. It would be nice to stop buying the frozen kind! I love gnocchi, this sounds like a great variation for fall! Mmmm, gnocchi, brussels sprouts, everything! I agree with the whole trusting your instincts thing. Sometimes I forget about my instincts when I’m cooking and regret it later, but when I follow them I’m always happy. This looks like a great quick dinner. Pinned! Yes, I do the same! Sometimes I’ll be making a recipe and I know something doesn’t seem right, but I follow the directions instead and I always regret it. Gorgeous photos, Kiersten. I love everything about this dish! A simple and delicious wintery dish. I love the flavours. i always loved gnocchi. it’s so dough and hearty and delicious. this looks so comforting and delicious! I hate brussels sprouts and this looks fantastic to me! I can’t wait to try it. There’s something about roasting brussel sprouts, make it delicious. this is such a comforting hearty meal. Yes, roasting them is definitely the way to go! I have some pumpkin gnocchi waiting in the freezer. I bet it’d pair perfectly with brussels sprouts! Ooh yes, pumpkin gnocchi would work really well in this recipe! I remember those early days of trying to improvise in the kitchen so well. Especially that one time I tried recreating a dish I had in a Moroccan restaurant in Spain. I just couldn’t stop myself from adding more and more ingredients and while the end result was still edible, I really learnt that day that one has to learn to know when enough is enough. The quick pasta, or here gnocchi meals never ever failed me, though. And right now I am thinking of actually making gnocchi myself this coming weekend. Thanks for the inspiration! Yes, less is always more. When I first started developing recipes, I always thought recipes had to have a long list of ingredients in order to be good. Which definitely isn’t true! This looks so yummy. I have some Italian Sausage from Field Roast- it cam highly recommended. Have you ever tried it? I was thinking of skipping the gnocchi (low carb!) and substituting with the sausage. What do you think? Field Roast Italian Sausage is my favorite! I don’t buy any other brand because theirs is the only one made with real ingredients. 🙂 If you substitute sausage for gnocchi, it’s going to be a completely different dish, but Italian sausage + roasted Brussels sprouts will still be delicious! My instincts are telling me to make this gnocchi. I love brussel sprouts more than words can say.